Bronycon is under way, and your dedicated Equestria Daily reporters are here to bring you the latest news! Today, I was able to sit in on the exclusive press conference with the author of the official pony novels, G.M. Berrow! She gave us a handful of info, not the least of which was the title of the not-yet-aired Season 5 episode she wrote. Get it all below the break. How did you get into your career in writing? Berrow became interested in writing books or for tv while in college, and her first opportunity to work with a show was as a production assistant for Law and Order. When it came to actually writing, she admitted she didn't want to work on serious shows. Eventually, a friend who had reviewed some of her practice scripts helped her make her first connection into real writing jobs, and eventually, she was approached for MLP. What is your writing style/strategy for the MLP books? Berrow stated the MLP characters are relatively easy to write because their characters in the show are so well defined by this point. The challenge, she claims, lies in finding interesting stories that haven't already been done, either by the show or the official comics. She does her best to weave in the content of existing episodes, and feels her books fit into specific points in the show's ongoing story. She also mentioned that the books contain little easter eggs concerning currently unaired episodes of the show, but it will impossible to tell what they are until the episodes air. How did you get approached about doing an episode of the show? After the publication of her first book, she casually mentioned she'd be interested to Meghan. Over a year passed, and then suddenly she was approached and was taken up on her offer. The episode Berrow wrote is "The One Where Pinkie Pie Knows", airing later this season. Is there any information you can share about upcoming pony books? Berrow is currently working on the princess series. The next book will be "Princess Luna and the Festival of the Winter Moon". She wasn't able to reveal much about the story itself, but told us that the CMC would play a big role. There are also books for Cadance and Princess Twilight planned. Each book also represents a season of the year: Celestia's was summer, and Luna's will be winter, though Berrow didn't reveal which of the remaining princesses was spring and which was fall. -G.M. Berrow's coworkers and friends sometimes make cameos as characters in the books. For example, two of Applejack's apple trees were named after Jim Miller and Stephan Andrews. There are lots of less obvious cameos than that one, too. -Some of the future books may have "unexpected characters" as the stars. -Berrow's favorite character to write is Daring Do. 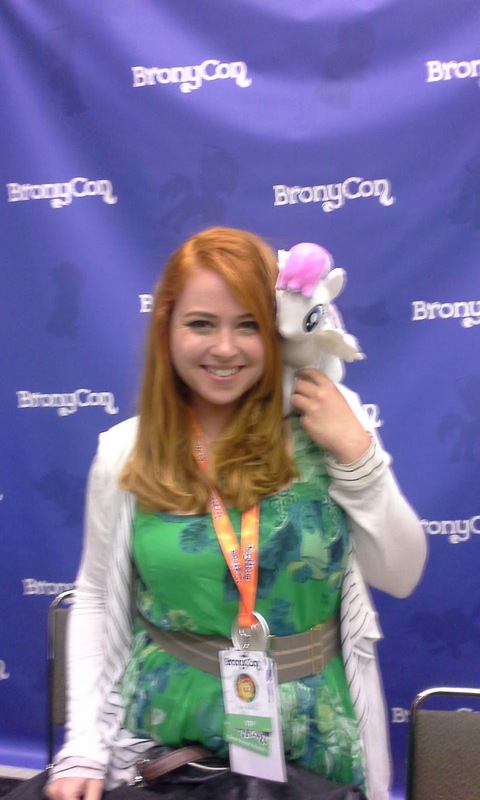 -Meghan McCarthy was the one who established the piece of lore in Berrow's first book regarding Cadance being a pegasus before she was an alicorn. "So yes," she assured us, "that is canon." -Berrow was the one to give Marble and Limestone Pie their names. She told us she chose those names because the first initials of Marble, Limestone, and Pinkie spell out MLP. That's all from that press conference, although Berrow also appeared on the show writer's panel and will be appearing on her own panel later, so we will have more info about her, and of course all the rest of the staff, soon!